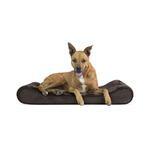 Give your best friend the comfort and orthopedic support they need with a FurHaven™ Minky Plush Luxe Lounger Pet Bed in espresso. This ergonomically-designed pet bed is contoured to cradle your pet’s body and provide therapeutic back and neck support. 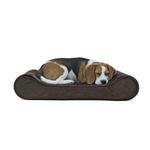 The Minky Plush & Velvet Luxe Lounger Pet Bed features dense, medical-grade foam that provides soft, yet firm support for a more restorative night’s rest. Minky Plush sleep surface is super soft for the ultimate “cozy” experience. Step-on bed design is easily accessible by smaller, older or disabled pets. Removable, washable cover is manufactured using overlock safety stitching for longer lasting durability. This pet bed includes a water-resistant polycanvas base panel and is available in three stylish color options to blend with any home décor. Foam core is CertiPUR-US® certified and may be spot cleaned. Pet Bed cover is zippered and may be machine or hand washed. 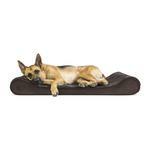 For optimum pet health, FurHaven uses low VOC, CertiPUR-US® certified foam. This domestic foam is made in the U.S.A. without PDBEs, TDCPP or TCEP (“Tris”) flame retardants, mercury, lead, and other heavy metals. Our foam is manufactured without formaldehyde, ozone depleters, and phthalates regulated by the CPSC. I have never received anything of poor quality from Baxter Boo. It is definitely my first source for small dog clothing and harnesses and leashes. However, the pup I am currently buying for is extra tiny and I found very few items that met my needs.